Garad (also known as Garod) silk is one of the popular styles of saree that has its origin in West Bengal. Also known as Gorod, the word Garad means ‘White’. Garad silk sarees are distinguished by its red border and small paisley motifs. Silk fabric used to weave Garad sarees is not dyed which keeps the purity factor of the fabric intact and therefore these sarees have a sacred importance to the women in Bengal. The Murshidabad district of West Bengal specializes in weaving these Sarees wherein the silk yarns are woven close together which imparts the fine texture to the sarees. 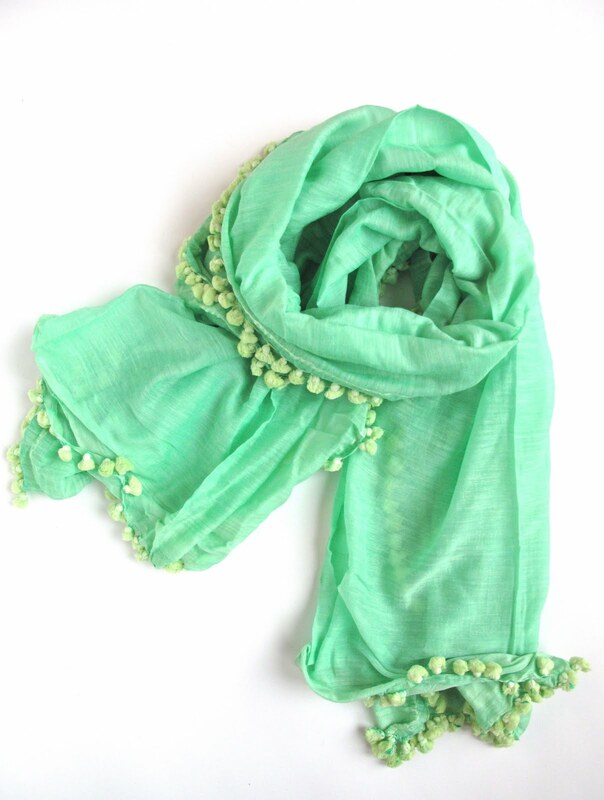 The Garad Silk is manufactured from Tussar or Mulberry Silk and is not dyed to retain the natural color of silk. The color white is regarded as a symbol of purity; hence women prefer to wear a Garad Saree for special occasions and religious ceremonies. Bengali women prefer not to stitch a fall in these sarees to preserve its sacred quality and wear it in its purest form. The Korial Saree is a close alternative to the Garad Silk Saree. West Bengal is a rich state producing different types of sarees like Taant cotton sarees, Baluchari Sarees, Dhakai Jamdani sarees, and Batik Sarees, along with Garad silk sarees. But, there is another style of Bengali saree which resembles the design and looks of Garad silk sarees, and is known as Korial sarees. Every Bengali women no matter in which corner of the world she resides, prefer to own at least one Garad or Korial saree in her closet. The border of Garad sarees are distinctive in colors, mostly red and maroon which gives it a rich look. On the other hand, Korial saree (also known as laal paar sari) is also identical to Garad saree except the border which is more intense in design and rich red in color. 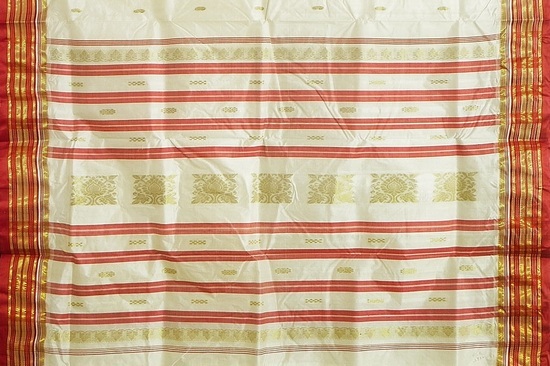 What distinguishes Garad saree from Korial saree is that the former contains small floral and paisley motifs across the length of the saree while the latter is plain white in color with red border. 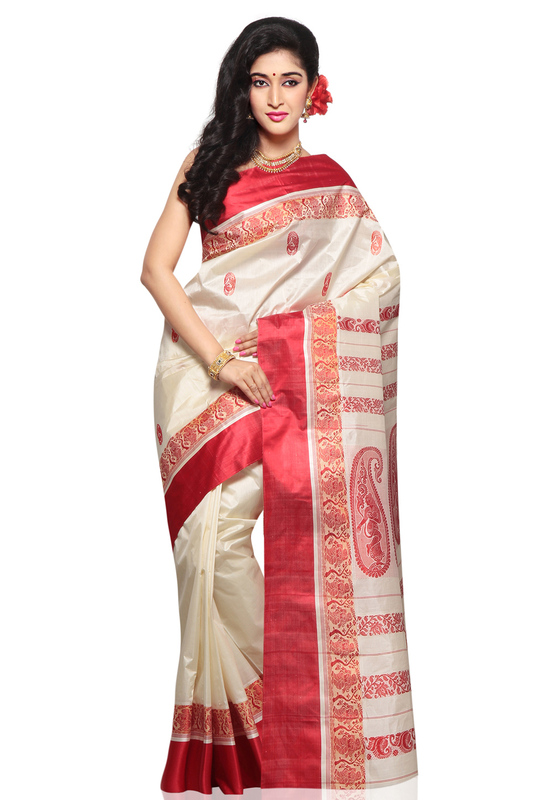 Korial saree is mostly worn while sindoor khela during Durga Puja. 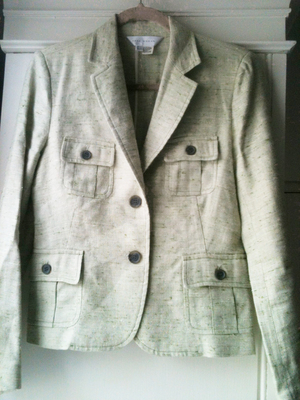 Garad is considered as a coveted item and the natural color of the silk makes it an expensive outfit. 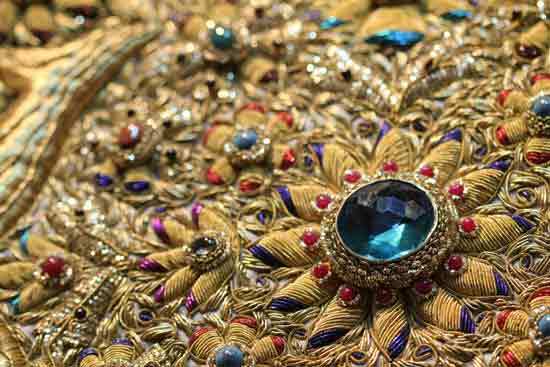 Tracing back the history, one would fine that the kings and zamindars in ancient times used to drape themselves in this saree to perform religious ceremonies and rituals. Garad sarees are quite popular among the Bollywood beauties as well. Actresses like Bipasha Basu, Rani Mukherjee, Kajol, Celina Jaitly drape themselves in Garad sarees to perform the auspicious ceremony of Durga Puja. 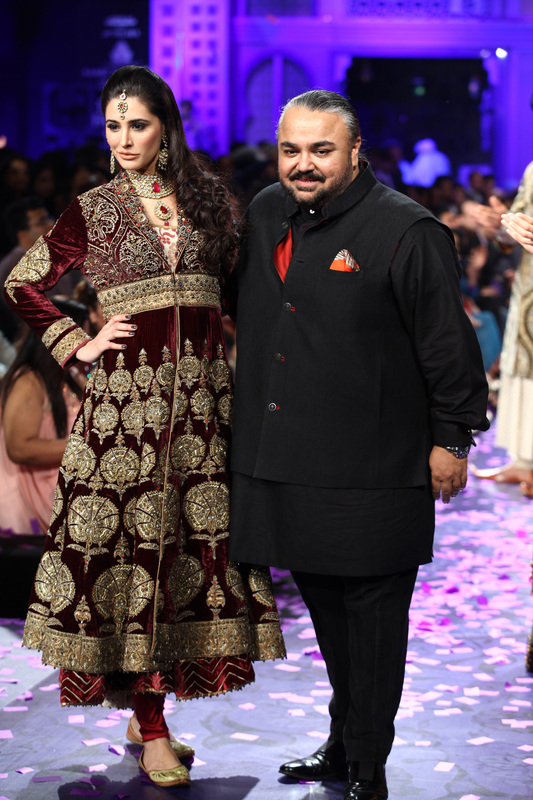 Besides this, Garad sarees are also seen on fashion runways. Fashion designers have also experimented with this traditional saree drape. Designers like MonaPali, Soumitra Mandal, Debarun, and Neeta Lulla have showcased their creative versions of Garad sarees on the fashion runways. Garad silk sarees should preferably be dry cleaned or hand washed with mild detergent.